I love a tasty Mexican/Southwestern meal and this recipe below fits the bill. It’s easy to put together, inexpensive, and flavorful. If you want a equally tasty side dish to go along with it I suggest Seasoned Black Beans (recipe below). My husband doesn’t usually eat black beans and he liked these! You should try them! Preheat oven to 350 degrees. Fill each tortilla with shredded, cooked chicken and sprinkle with cheese. Roll tortillas (like a burrito) and place seam side down in a baking dish. Melt the butter over medium heat. Then, add the flour and whisk until combined (it will be thick). Then, add the chicken broth, soup, chiles, sour cream, salt, and pepper. Whisk for about 5 more minutes until all ingredients are combined and the mixture is heated through. 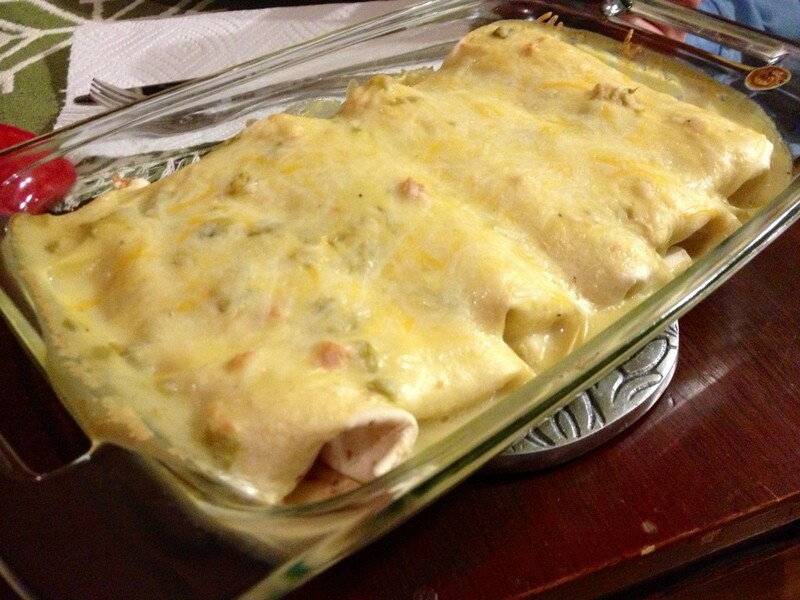 Pour the sauce over the enchiladas, covering them well. Sprinkle the top with more cheese. Bake 25-30 minutes and serve. Note: The original recipe doesn’t call for any seasoning inside the enchilada, so I added some of my own. Click here for the link to the seasoning blend I used. Sprinkle over the chicken before rolling up the tortilla. You don’t need a lot!